Age of Kings Heaven » Forums » Scenario Design and Discussion » Wrath of the Traibs - Download Now! 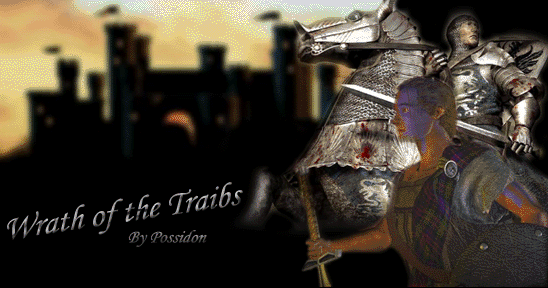 Topic Subject: Wrath of the Traibs - Download Now! "The Xandrian war has been the worst conflict in Dystonia for over a thousand years. Fought between two tribes, the Xanders and the Traibs, the war has been going for four years, and both sides are starting to grow weary. You play as Alexander, a mercenary hired by Sebastian. Your job is to spy on The Xanders, tell Sebastian everything you know and find out what has happened to Drent..."
I started this scenario back in early 2010 but I gave up after about a month of working on it and lost it. In about February 2011 I found all of my documents on it and thought; "Hey this could make quite a nice scenario" so I drastically built up the story and created an entire new map from scratch. After many years of on-and-off again designing, I finally finished and uploaded the scenario in February 2019. The Scenario is built on a Giant map and uses The_Slayer90's Crusade Expansion. It is set in the fictional fantasy world of Dystonia. The map is split into five Countries: Ehr, Zandria, Uldûrh, Versali and Lars. All of the people of world worship two Gods called Zachadom and Saphadema. ● A Giant Map of Central Dystonia, featuring the 5 Countries with many Towns, Settlements and Cities. ● A huge Backstory about the History of the World, Religion and Characters. ● Modded using The_Slayer90's Crusade Expansion. ● Classic fantasy features such as magic and whole new fantasy world and strange beasts. ● Music by awesome rock/metal bands such as: Skillet, Black Veil Brides, Biffy Clyro, Love Robot, & Epica. ● Music by legendary orchestral groups such as: Immediate Music, Two Steps From Hell and X-Ray Dog, Future World Music & Audiomachine. ● Music from epic film and TV composers such as: Hans Zimmer, Murray Gold, Howard Shore, Ben Foster and Nicholas Hooper. Click on the links to get a feel of some of the music that is featured in this scenario. I sent along a secondary report several hours ago, fyi. I've received a playtesting report from Sam and my MGC entry is completed. Should only be a matter of time until this is done. I'm hoping to get it done before December and out in time for the Game of the Year awards hopefully. Great to hear. I wish you the best regards to finishing this project. Sounds interesting. I can help play-testing and suggesting improvements. I'm up! Good luck on finishing this, I can't wait to play it. If you need a playtester I can do it but it is nearing the end of semester for me. I'm working on my entry to the Vanilla Contest at the moment, and then I've got a mass playtesting report to go through,. It will be done soon. I know you guys have been waiting patiently for this for about two or three years and I thank you for your patience. I haven't had much time in the last few months to go through Sam's incredibly detailed Playtesting Report due to my new job and my promotion to the staff here. But in what little free time I have I've been working on a lot more of the backstory for the world the scenario is set in, and Ive been planning the sequel which I have been teasing with pictures of my Mod. Anyway as a treat - here is a picture of a Timeline of Dystonian History for you. You might not understand any of it yet, but it just a little tease as to what's to come. I've got a bit of extra time in a couple of weeks so I might try and work on Sam's report then. - It starts as a normal Immobile AI. However, enemy ranged units will fire and retreat (chance of this happening increasing with the difficulty) when encountering your units to add to the difficulty dynamism. - To activate the AI into its B&D state, have a trigger send "AI Trigger 1" to the enemy AI. You can find it in the "AI Script Goal" effect in the trigger effect list in the editor. Just select the "AI Script Goal" effect, choose "AI Trigger 1" from the dropdown that shows up, and also select the enemy player that you want to send the signal to. - Once activated, a timer will run in the AI counting down to the initial attack. Once that attack is sent, a looping timer cycle controls the next attacks ad infinitum. It also cheats itself resources (except on Standard) so that it won't run out. Make sure you give the AI a decent starting resource amount, though, or it will be screwed on Standard. - The AI defends rather well - if an enemy army attacks, it will commit most of its troops to a defense and keep producing defenders. - The AI trains all the units you requested, with the number based on the difficulty. On Standard it trains 6 of each unit, on Moderate 8, and on Hard, 10. It also adds a few siege weapons based on the difficulty. On Standard it will build only one ram, on Moderate it will build 2 rams, a Mangonel, and a Scorpion, and on Hard it will build 3 rams, 2 Mangonels, 2 Scorpions, and a Trebuchet, and it will also upgrade its siege (so on Hard you will see Heavy Scorpions and Onagers). - I have it programmed to take all the necessary Imperial upgrades for this situation, but if you start it in post-Imperial everything will function perfectly as well - the only difference is that the AI will not spend the time researching the Imperial upgrades because they have already been researched. - The AI uses the Market (if it has one) to buy/sell resources to keep its eco balanced so it can keep its troop count at capacity. - The AI resigns when its military population drops below 5 and has no TCs, Castles, Archery Ranges, Barracks, Stables, and Siege Workshops left. If you have something else in mind, let me know. Thanks Alot Sam. This should be the last piece of the puzzle. Is there any chance you could do a (Hopefully) final playtest when I'm done with these final bugs? Should be done by next week if I have the time. So I've just sent what is hopefully the final version of the scenario over to Sam for a playtest. Who's excited to finally play the scenario? Expect it in by the end of the month! Possidon, I've received your email, but you seem to have forgotten to attach the file. Mind resending? I resent it. Have you received it yet? "His prized possession was a Strange Emerald ring..." --> neither strange nor emerald should be capitalized here. "Now Our Story Begins..." --> only "Now" should be capitalized here - "our," "story," and "begins" should be all lowercase. "You are going to need to buy buildings when it comes to the B&D part of the Scenario." --> "scenario" should not be capitalized. When you get your stuff in Zandria for the B&D, there is a trade cart in the huge mine that changes to your control but is stuck in place by triggers. Just remove it once the B&D starts - otherwise it uselessly takes up population space and is toggled every time the player hits the idle villager button, so they will delete it anyway. There's a spot in Ehr where a lumbercamp is stacked on a siege workshop. Part of the lumbercamp outline shows behind two nearby houses. This is nitpicking, but you can get rid of the ugly outline by removing those two houses. The enemy player gets control of a few towers in Ehr on the edge of the map surrounded by a bunch of allied houses. This is just annoying to destroy because the only way to destroy them is mangonels and ranged units. Pre-emptively, if the enemy player is training Huskarls out of that castle in the corner, then they're going to run out of walkable space to spawn and therefore get stuck. This can be avoided if you use a task effect to simulate a gather point. The enemy player also has no population headroom buildings other than a castle, meaning that they're capped at 20 population. Use Trigger Studio to tribute the enemy player the population headroom they need for the B&D portion of the scenario. When Alexander and Sally spot General Desmond by the mine, Alexander says "Listen...They're Coming This Way! We need to Go NOW!" --> only "Listen" and "We" should be capitalized in that dialogue (though "NOW" can also be all caps to simulate shouting like you intended). When clicking on Offa's statue in Ehr, it says "This is a statue of King Offa the Brave, the founding and greatest king of Ehr. --> "founding" should be "founder" instead. When clicking on Kelburgh after Alexander meets Sebastian and is told about his quest, Alexander says "You're Sebastian's Scout Right? ..." --> "scout" and "right" should not be capitalized, and there should be a comma just after "scout". He then says "Thank You Kelburgh." --> "you" should not be capitalized. Thanks Sam. I'm away for a week but will sent it to you as soon as I get back. Wow, this is still going strong! 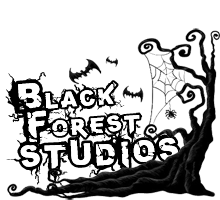 Probably one of the biggest Black Forest productions that's actually going to reach a finished state, haha! Good to see this, Possidon. Don't forget to post over on the BF forums with a release thread or something so I can archive it as a BF product. Finally got that working version sent to you. I'll work n fixing those suggestions you posted the other week now. Received! I'll have a look soon. Possidon, you might want to consider slightly updating your readme file to note that the .cpx goes in the scenario folder if the player is running UserPatch. - The beginning scene takes a while to start (1min30 game time of silence and nothing happening), you might consider starting it a bit earlier. - There is music in some scenes, but none throughout much of the actual gameplay - perhaps you could add a looping soundtrack/set of tracks for each part of the game? - Once Alexander and Kelburgh change ownership back to my side, a scout cavalry is also created for player 1 near a set of enemy troops and immediately killed by them. - Perhaps some HP buffs to the enemy troops you face on the way back from the swamp could help ramp the difficulty up a bit. I could just patrol Alexander and Kelburgh back to Ehr and watch as they dispatched everything in the way. - Alexander really needs some more LoS. He currently sees only two tiles away from the one he's standing on, which makes it a real pain to explore the map and see where you're going before you blunder into a ton of enemies. - The map has a ton of multiple gateposts that need deleting. - A bugged task object effect on the Knight of Lars whose horse you find causes all gaia animals on the map to be tasked to the Lars military camp. I ended up killing them all as they walked in so it wouldn't cause issues with the B&D later. It also causes the "statues" (invincible units) to move. - Killing Jason (and his guards) is likewise easy because of the purple player being allied to you. Additionally, if you kill him at the mine instead of waiting to follow him to the woods, you get no reward. - There was no way to activate the quest to save Elenore. - When approaching the cave by the banished Xander warriors, a bugged task object effect sends all gaia animals to the cave. Additionally, one can walk over the cave entrance and onto the mountain, which looks a little odd. It also causes the "statues" (invincible units) to move. - After killing the third bandit lord, I'm prompted to go back to Sebastian to claim a reward. When I go back to him nothing happens. - In Versali there is a longbowman named Bertrand who just sits there. Nothing happens when I approach and click on him. Is he supposed to give you a quest to kill Arldor the Wolf? - Make sure to remove map revealers in various parts of the map after an objective is completed or a cutscene ends. Two revealers sit by the Ethinda bridge, for example. - Use Trigger Studio to garrison a horse inside itself to serve as a hold-off unit instead of the unit in the transport ship in the corner. It's cleaner, can't be selected by the idle military hotkey, and doesn't take up population space. - Make sure to deactivate objectives after they've been completed. Otherwise the crossed out objectives clutter up the objectives screen and make it a bit of a pain to scroll through and find what you need to do. - It's possible to make the purple player resign before the B&D by destroying most of their military. That shouldn't happen, so I can fix the AI and send it to you. - In the southernmost part of the Xandrian farms, there is a gaia farm that converts to the player when approached. - At the start of the B&D, there seem to be some misfiring triggers that cause the dialogues of Drent suggesting to recruit men from Uldurh and Muriella saying she is willing to make a sacrifice for the greater good to fire at the same time, which looks odd. - The blue prison guards that went to investigate the scaffolding that Alexander burned down should be removed at the start of the B&D - they otherwise just get in the way. - When the B&D starts, the walls, gates, and towers (and enough houses to max out your population) should change to your control. The enemy currently just waltzes on through the blue gates with no opposition, which looks odd. Having to build more houses when you already control a huge city is also strange. - Both the purple and the yellow player launch attacks on your city fairly early. This is not a bad thing, except for the fact that they bring their heroes as well. King Daniel and King Sebastian both marched to my city and died (winning me the game) without me having to attack either of their bases. Perhaps a good solution would be to rename the grey player to "Enemy" as well and change the ownership of the enemy heroes (King Daniel, General Leonardo, King Sebastian, General Jonathan, Kelburgh) to the grey player so they sit in place until you bring the fight to them. If they remain under the control of the yellow and purple players, the AI will send them to attack your base no matter what. - Yellow attacks in force early on, but their attacks thin out because they don't have a means of producing more troops. Perhaps triggering more yellow troops to spawn every so often as long as Daniel is alive could help make them more competitive here. They also resign if their troop count drops below a certain level - I'll remove the resigning rules from their AI as well. - [In objectives] "Talk to the People of the Kingdoms, Ehr of Lars and Uldurh..." --> "people" should not be capitalized, and it should say "Kingdoms of Ehr, Lars, and Uldurh"
- [In objectives] "Help the Lighthouse Keeper fix the Light, Collect...then Click on the Lighthouse the Fix it. --> all bolded capital letters should be lowercase, and the bolded "the" should be "to"
- "Alexander: OK I'm heading that way anway, so yeah sure." --> "OK" should be "Okay" and "anway" should be "anyway"
- "William: There is however another way into the kingdom' through the dark forest of Versali." --> put a comma after "is" and "however" and delete the apostrophe after "kingdom"
- [In objectives] "Steel Ppatemail shirt" --> "Ppatemail" should be "platemail"
- "Noah: Don't be afraid, we won't hurt if you co-operate." --> add "you" right after "hurt"
- "Alexander: That's it! I've killed all three Bandit Lords. I should return to Sebastian to claim a reward." --> misuse of the color tag - instead of ""
- "Saly: Oh, you were being serious?..." --> "Saly" should be "Sally"
- "Alexander: Thats strange. If this war is about Yassen's atheism..." --> color tag needs fixing, and "Thats" should be "That's"
- [In objectives] "All of your Heroes MUST ALL Survive" --> neither "Heroes" nor "Survive" should be capitalized, and the repetition of "all" is redundant - it would be better to say "All of your heroes must survive"
Cheers Sam. I'd appreciate that you feedback via email in future to avoid letting out any spoilers. I have received your eail with the updated AI. Many thanks. I'll work on it as quickly as possible. Hi Sam. I'm trying to get some bug fixing done today but I've lost the update AI you made. Have you still got it? Can you resend it? Sure! I just sent it to your HG email. I'm so pleased that Wrath of the Traibs has been featured as this month's Works-in-progress Spotlight! Go and check it out. Sounds good! Sign me up for playtesting too! Very much excited about it! I just realized something... its actually "Wrath of the Traibs"
I Always thought it was "Wrath of the tribes"
please forgiv me allmighty possidon!